Barbara Opitz is a graduate of New York City’s High School of Performing Arts and has studied dance with a variety of famed performers. She holds a B.A. from Queens College (City University of New York) and an M.A. from Teacher’s College, Columbia University. A professional dancer in New York City, she taught ballet for twelve years and has choreographed numerous dances and theater productions, including YENTL, THE THREEPENNY OPERA, MACBETH, THE COMEDY OF ERRORS, THE MERCHANT OF VENICE, ARCADIA, METAMORPHOSIS and A MIDSUMMER NIGHT’S DREAM for the Theater Department, AMAHL AND THE NIGHT VISITORS for the Music Department, and THE WIZARD OF OZ for Home Made Theater. She has also taught in special education programs and on the elementary school level. Barbara teaches Movement for the Actor for the Theater Department and was co-founder of the Skidmore Shakespeare Programme, our study-abroad program in London. She also served as co-administrator for that program for many years. Barbara was formerly the Assistant Director of the Office of Student Academic Services and is very active in advising our students in both Department and College matters. 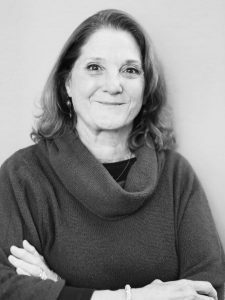 She is currently serving as a producer of The Saratoga Shakespeare Company, an Actors Equity summer theater company in Saratoga Springs.